Since July 2012, when I gave a keynote talk at U Design 12, Portugal’s first PhD design research conference, I have shown and evolved a simple four-way matrix as a means to think about how designers might ‘orientate their activism’ (1). The two axes of the matrix show the role of the designer and the role of the social actors and stakeholders. 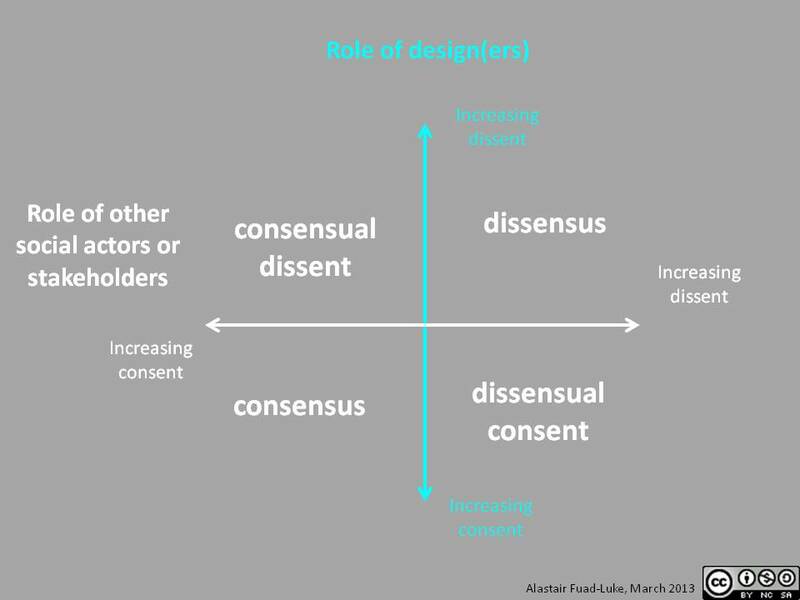 At one end of each axes the role of the designer/stakeholder is to ensure design by ‘consensus’, at the other end it is to ensure a design by ‘dissensus’. Here I define ‘consensus’ as general agreement and a position of mutual consent within a group of people which finds full sensory expression that is culturally acceptable, although the consensus might not be taken as a given or normative position, and might not sustain over time. I take Jacque Ranciere’s definition of ‘dissensus’ as ‘a conflict between two regimes of sense, two sensory worlds’ and as ‘an organisation of the sensible where there is neither a reality concealed behind appearances nor a single regime of presentation and interpretation of the given imposing its obviousness on all’ (2). So, we have four cells in the matrix which can be named as ‘consensus’, ‘consensual dissent’, ‘dissensual consent’ and ‘dissensus’ (Figure 1). 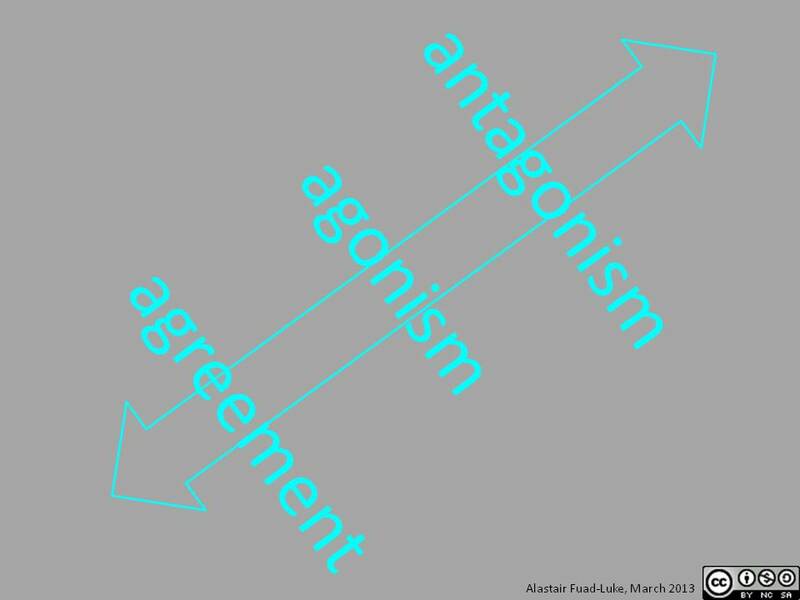 Drawing a line from the bottom right to the top left cell of the matrix represents a continuum of orientation from ‘consensual agreement’ to ‘agonism’ and ‘antagonism’ (Figure 2). Here, ‘agonism’ is framed by the arguments of Chantel Mouffe as a means to represent pluralistic views in democratic societies (3,4). Antagonism I frame as a condition of being a principle, force or factor by means of resistance, opposition or contentiousness as a means to struggle against something (5). What sort of design approaches might then be invoked to support the strategic decisions around consensus, dissensus, agonism and antagonism? Consensus requires participation where the voices of the participants are equally heard and justly acted upon; agonism and antagonism also require participation but the degree or level of participation is controlled by the designer. 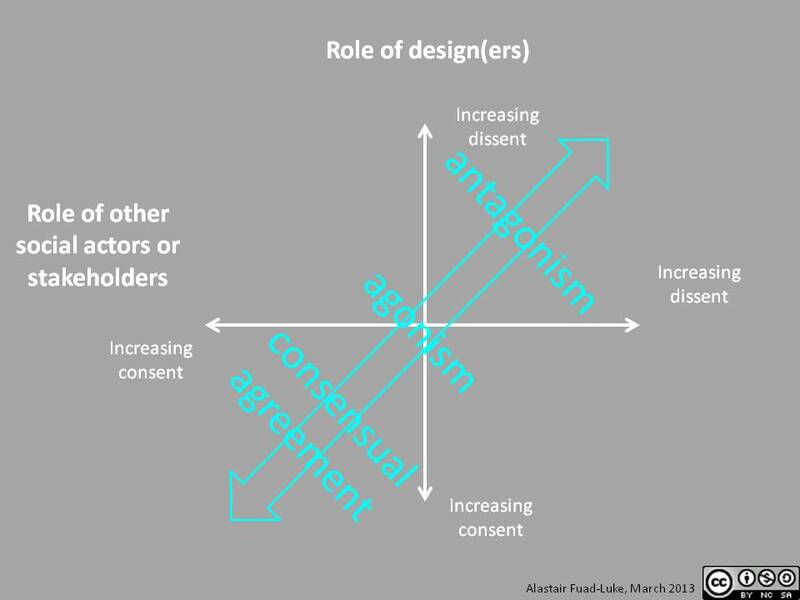 Consensual processes of participation can occur upstream or downstream or at the time of constructing the design brief but, whatever the timing, the participants are embedded in the processes and at no time seen as subjects, users, consumers or ‘other’. This requires particular forms of participatory and co-design but it can also embrace ideas of co-creation, open design, open innovation and collaborative service design. Agonism and antagonism are less referential to this notion of embeddedness and so can range between full participation, interaction and/or observation. Agonism and antagonism might be collectively or individually conceived and implemented as diverse artifacts and interventions (6) , f(r)ictions (7),critical design (8), or other disturbances to the ‘regimes of expression’ (9). Today’s complex societal challenges demand polydisciplinary attention. If designers are to contribute to societal transformations to help deal with these challenges, then it is necessary to orientate one’s action and activism. Choosing between consensus and dissensus, agonism and antagonism, collective or individual action will depend upon the specific societal ‘issue’, locale and context in focus. Knowing one’s purpose and being armed with the right strategy and design approach will, hopefully, engender more positive change by design(-ing). (1) U Design 12 was Portugal’s first design research conference co-ordinated by ID+ Research, a combined research platform for the University of Aveiro and University of Porto, held in Aveiro on 14 July 2012. My keynote talk was entitled, ‘Design(ing) for Transition and contingent eco-socio-political realiites’. Web link? (2) Ranciere, Jacques (2009) The Emancipated Spectator, p48, p58, London:Verso. (3) Mouffe, Chantal (2000) ‘Deliberative democracy or agonistic pluralism’, Reihe Politikwissenschaft/Political Science Series 72, Editor: Christine Neuhold, Vienna: Dept. of Political Science, Instittue for Advanced Studies (IHS,) accessed 12.03.2013. (5) A definition conjoined from The Free Dictionary, and Etymology Online. (7) Gaspar Mallol, Monica (2011) ‘F(r)ictions: Design as a cultural form of dissent’. Paper presented at Design History Society’s conference Design Activism Social Change, Barcelona, September 2011. (9) Ranciere, Jacques (2009) The Emancipated Spectator, p124-125.